Linked index list of the Soil Selfies by place. This index list is alphabetical within its sections: global – by regions and countries; Australia by states; and Wimmera-Mallee, by towns, where this project originates). You can also access the collection by drop-down menus from ‘Soil Selfies’ then ‘locations’. Direct links are added as each Soil Selfies is completed with its close-up, in use and challenges/managements photos and notes. Use direct links ‘list’ or drop down menus to go to section lists. These have summaries for each Soil Selfies, with key photo icons and short descriptions, so you can choose where you would like to visit. Click on the link to go there. This collection has 70 Soil Selfies now, and is still growing. Please return! West Australia – WA, would love a submission of your red soils. ACT – ACT would love a submission of your ‘capital’ soils. Picardie- Somme Bois du Sart-Heath Memorial Cemetery, Somme garden. Savoie – Arvillard Koute a Tyon, Magland. et en francais– Koute a Tyon, Somme Bois du Sart, Somme jardin. Thank you to everyone who responded to the call in Feb-March 2015 (and since) for photos and descriptions of their soils to share and raise awareness of the diversity, values and issues of soils from the Wimmera – Mallee, Australia and anywhere in the world to create this volunteer free on-line educational soil resource. 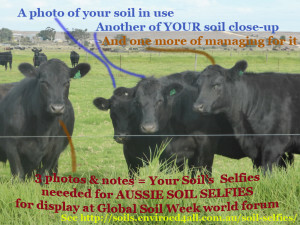 Thankyou to the IASS and Global Soil Week whose interest in this project brought it to Berlin for GSW and to the GSW people I met there and elsewehere on-line in the world, who together inspired me to keep going with this and get so many of the photos and notes onto this website as the Soil Selfies Collection. Soils is now a UN Decade, so I will keep growing this collection so long as contributions keep coming in (Instructions are on the Soil Selfies intro page), but I also need help to publicise it. There is much to be appreciated and learnt about our world through these wonderful and inspiring Soil Selfies. Thank you. Contacts are here, especially if you would like to support me in my freelance environmental education work, with a donation.